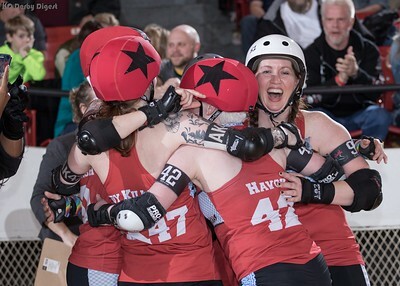 It’s getting harder and harder all the time to deny that what’s unfolding in front of us is one of the most dramatic and insanely interesting seasons of roller derby the Kansas City Roller Warriors have had in quite some time. Some years, if you knew the teams, you knew who was going to win as soon as bouts were announced. Others, it was a little murkier than that. But so far, 2017 has proven to be one of the most wildly unpredictable seasons in recent memory, and particularly where the fans are concerned, that can only be a good thing. KCRW hosted Bout 4 two Saturdays ago on the 11th, and I think it’s safe to say that no one could have predicted how that was going to go. The first game of the evening featured a back-and-forth contest between the Black Eye Susans and the Dreadnought Dorothys that had fans on the edges of seats before the first half was even over. These two teams slugged it out and traded the lead no telling how many times, and although the Susans led the Dorothys 107-88 at halftime, it was the Ruby Reds who roared back and maintained their undefeated record, taking down the Black & Yellow by a final score of 213-188. That’s a difference of only 25 points, and well within striking distance for any team, provided there’s still time on the clock. Like I said, it’s an unpredictable season. Click for the Dorothys/Susans photo album. Immediately following was probably one of the most unexpected events of the season. The Knockouts, winless in 2016 and winless thus far in ’17, demolished the Victory Vixens from the first whistle to the last. If memory serves, the Red, White, and Blue never held the lead during this bout, and the Glitter Mafia’s lead only widened as the night went on, going from a 126-70 lead at halftime to a final score of 272-169 — a difference of 103 points, and probably the most decisive victory we’ve seen so far this season . Taking nothing away from the Vixens’ enormous talent and fortitude, this Knockouts squad celebrated a hard-earned and well-deserved victory, and hopefully one that turns the season around for them. With this win, no team in KCRW is out of the running for a Rink of Fire championship appearance at this time. Photos, of course, are here. Click for the Knockouts/Vixens photo album. This Saturday night, the Kansas City Roller Warriors All Stars and Plan B teams take the track again as they face the visiting Chicago Outfit. Doors open at Memorial Hall at 5:00 p.m., and the fun begins promptly at 6:00. Tickets are $10 for adults and $5 for kiddos ages 12 and under. Click here for the Facebook event page, and make plans to support your Wolfpack at Memorial Hall this Saturday night!